Everything and everyone and I love the Victorian era, flowers and butterflies. Metals, Miyuki, Toho, Czech beads, Swarovski, pearls and gemstones. 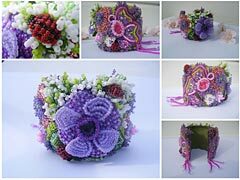 It was made for a seed bead contest here in the Netherlands with a spring theme. 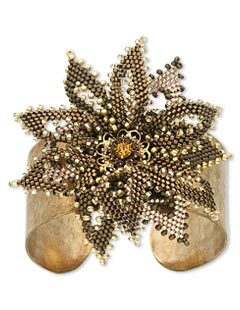 I had an idea to make some kind of wrist corsage and I started with the flower and then it was growing under my hands. Members of the jury were Sherry Sarafini and Heidi Kummli and I won the first prize, an autographed book of Heidi and Sherry. As a child I was continuously busy with drawing and painting. It now helps to bring ideas in my head on to paper, to make it visual. It is my full-time career and there is not a day gone by without playing with my beads. I also have a website were I sell beads and homemade soap to make decorative soapchains as an accessory for the home. I have a website www.sanniesieraden.nl were I sell my jewelry and I have a website; www.zeepjesenzo.nl were I sell my beads and homemade soap. I donated jewelry to the cause www.sieradenvoorhetgoededoel.nl/ for mortally ill kids, they make the dreams and wishes of these children come true. If you really want something, dreams can come true!